i Click 'view all' to instantly compare this fantastic deal with offers on other top compasses. BYP Stainless Steel Circle Drawing Compass Geometry Sets Math is currently selling at $10.84, approximately $1.72 lower than average, giving a potential saving of $5.15 right now. With a lowest price of $10.84 and an average of $12.56 it is selling on the low end of its usual range. Price volatility is 0.3% (meaning it does not change often), so the price should stay low for a while. Right now this product is a recommended 'fantastic deal'. The current deal is also the best price on this item over the last month. 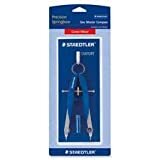 Compare the current price, savings (in dollars & percent) and Buy Ratings for the top Compasses that are closely related to BYP Stainless Steel Circle Drawing Compass Geometry Sets Math. Here is how BYP Stainless Steel Circle Drawing Compass Geometry Sets Math compares with other leading Compasses. 1. Sturdy, lightweight and easy to handle2. Center wheel allows for easy micro-setting of any radius up to 3.15"3. Direct view of vertices allows more accurate constructions4. Micro-set center wheel for easy adjustment.5. 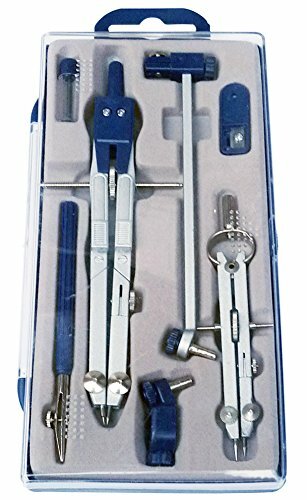 Geometry tools, especial suitable for school teaching use.Specifications:1. Material: Steel2. Color: Silver and blue3. Case Size: 8.66" * 4.06" * 0.79"4. Weight: 180 g / 6.35 oz5. Package Included: Transparent box + silver metal compass 5 Pack +Refill. 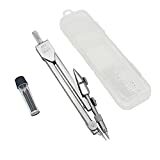 Features?Mechanical pencil for compass with 2 mm pencil lead, used for drawing circle or circular?Made from Stainless Steel and environmental plastic, durable and easy carry?Geometry tools, Ideal for math classes, drafting, architectural drawings, engineering designs, both mechanical design and construction. ?An Extension Beam attaches to the big Compass for drawing large circles. You can draw larger circle without lots of measuring and connect dots.